Well, we were lucky again today! Even though it looked like it might rain all day, we were able to get in another full day of activities! 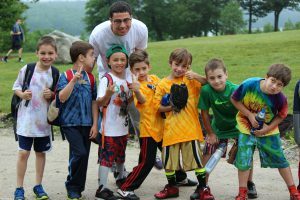 The morning started off with almost everyone dressed in Tie Dye because today was Tie Dye Thursday, a tradition that began about 4 years ago for the campers to showcase the shirts they made in Arts and Crafts. The campers again went around to activities by bunk to the ones they did not get to attend yesterday. They were also able to finalize their schedule changes. Today we also started our Clinics. For those who do not know clinics take place after 6th period and before dinner. It is a time for us to offer some specialized programming, a practice for an inter-camp, or just the chance to do the activity you love most. Everyone was so excited and today’s choices ranged from Frisbee to tennis to friendship bracelet making to soccer and much, much more. Tonight was a Unit Night for evening activity. As I walked around to each one, you could tell everyone was having a blast. The Critters did crazy relay races; The Prowlers did games in Uncle Milts; The Timber Boy’s played British Longball (combination of soccer, baseball, and about 12 other sports); The Timber Girl’s played “Steal the Kosher Bacon”; The Summit Girl’s played Upper vs Lower Dodgeball (and yes, I did play a game with them and got out both times); The Summit Boy’s also played British Longball. All in all it was a full and fun day. Tomorrow looks a bit wet but we have a few ideas up our sleeves to ensure another fun filled day at Camp Micah!